Derek N. Benner is currently the acting Executive Associate Director for Homeland Security Investigations within U.S. Immigration and Customs Enforcement. 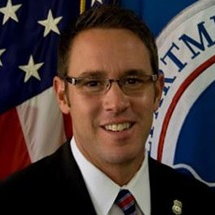 Prior to this assignment, Mr. Benner served as the Deputy Executive Associate Director for U.S. Immigration and Customs Enforcement (ICE), Homeland Security Investigations (HSI), an organization of more than 9,000 employees, which includes more than 6,000 special agents who are assigned to 26 Special Agent in Charge offices in major cities, 185 other field offices throughout the United States, and 62 overseas locations in 46 countries. HSI’s investigative and enforcement initiatives and operations target cross-border criminal organizations that exploit America's legitimate travel, trade, financial and immigration systems for their illicit purposes. Prior to this position, Mr. Benner served as the Assistant Director of Domestic Operations with oversight of HSI’s 26 domestic field offices. Mr. Benner also served as special agent in charge for U.S. Immigration and Customs Enforcement’s (ICE) Homeland Security Investigations (HSI) in San Diego, California. In this position, he oversaw one of the largest ICE investigative offices in the nation, which includes a diverse cadre of federal agents, intelligence analysts, and professional administrative staff at HSI offices throughout San Diego and Imperial counties. He also oversaw a number of HSI-led multiagency tasks forces, which include state, local and federal law enforcement members working together to target cross-border criminal organizations that exploit the legitimate travel, commercial trade and financial systems in the California/Mexico border region. Prior to this assignment, Mr. Benner served in several key leadership positions at ICE headquarters. As the deputy assistant director of HSI’s Financial, Narcotics and Special Operations Division in Washington, D.C., he was responsible for the agencies national financial fraud and narcotics smuggling programs. He also served as chief of staff to the director of ICE HSI and provided management oversight at the national level. Benner began his law enforcement career with the U.S. Customs Service in 1991 as a co-op student. He worked at the San Ysidro Port of Entry as a customs inspector for two years before becoming a marine enforcement officer and a special agent with the U.S. Customs Service’s Office of Investigations in San Diego. In 2002, Benner was promoted to the management ranks where he supervised agents assigned to the local maritime smuggling task force and managed the asset forfeiture, intelligence and administration programs as an assistant special agent in charge in San Diego. Check out the incredible speaker line-up to see who will be joining Derek.